Scratch resistant sapphire crystal, Water Resistant to 100m, Case measures 40mm diameter by 12mm thick. 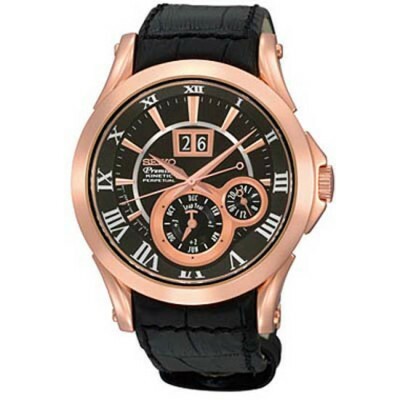 Rose gold tone stainless steel case with black genuine leather strap. Black dial with rose gold hands and hour markers. Perpetual date and month display, keeping accurate through leap years and changing months. Precise Kinetic movement, powered by the motion of your wrist. Case measures 40mm diameter by 12mm thick.